Affordabley priced & unmatched This user was entered into a sweepstakes after submitting their honest review. Sink into a luxurious night's sleep with the Swiss Lux medium density gusseted pillows. The gusseted sidewall configuration provides comfort and support for your head and shoulders, aligning your spine for a more natural sleeping position. The 220 thread count cover and PrimaLoft fill ensure incredible softness. I love these pillows..my head is supported comfortably while sleeping on my side or on my back. This set of 2 pillows arrived nice and fluffy and were quite comfortable because the filling seems light and bounces back pretty well. Like most other pillows out there though, these are beginning to flatten out a bit. They are still quite comfortable but don't hold my head up as far as they first did. Not too bad for the money though. Time will tell how far they will flatten but I'm not too unhappy because the price was good and I wasn't expecting miracle pillows, lol! fluffy pillows that are very comfortable with good support. Ordered these for a guest room and actually had one ask where i purchased the pillows they enjoyed them so much. 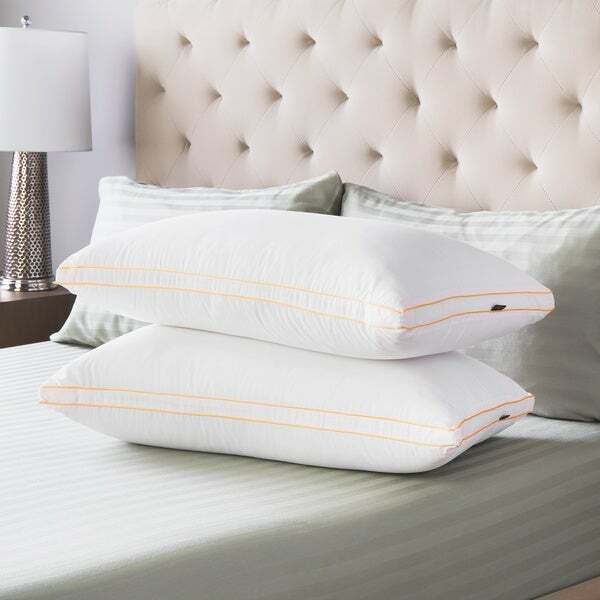 The pillows are soft and well-filled, but the filling is very loud to lay on and makes a scratchy noise anytime you move. I would not categorize it as a "down alternative" fill at all. Very synthetic and gritty feeling, unlike any down alternative fill I've previously purchased. Very disappointed and will be returning all 4 purchased. Tried out the *** pillows and these are so much more comfortable! You do not have to break the bank to get comfortable! Great pillows, but I've noticed the one I use the most is losing it's density and I've only had them 2 weeks. Not sure the quality is there. The pillows feel great underneath your head. They adjust to the weight of your head without going flat. Very comfortable and stays cool through the night. Perfect support & great quality! Love 'em! Flattened out after a year. They've lasted great...but they are a little too firm for me. VERY uncomfortable, too full makes sounds when laying on them. WASTE of money.